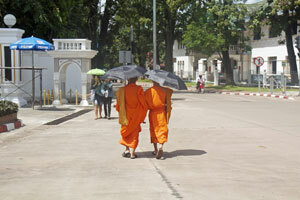 Perhaps the most shocking thing about Vientiane, Laos, is how sleepy it feels, in a very good way. Nearly everyone arriving in Vientiane will be coming from one of the major cities in Thailand, Vietnam, or perhaps Cambodia, and regardless of which, this is one mellow place. Actually, there are plenty of “mellow” towns in Southeast Asia, but none of those are the capital and largest city of their country. This is a city of nearly 1 million people that still manages to feel like a small town. Whether you are coming from Bangkok or Hanoi or even Phnom Penh, you are used to being shadowed by aggressive merchants and having to dodge traffic that pays no attention to any formal set of laws. But upon arriving in Vientiane, you’ll find mostly empty streets and that you’ll actually have to look for the souvenirs instead of them following you around town. 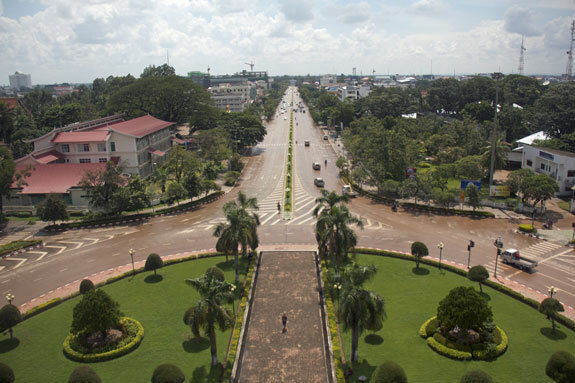 The entire country of Laos (the S is silent, by the way) is considered the backwater of Southeast Asia, but Vientiane itself is actually fairly modern. In fact, there are now a few chain restaurants (a Pizza Company and a Baskin Robbins) in a new strip mall in the heart of the tourist district, so things appear to be changing quickly. The town is set along the Mekong River, but it’s not really as scenic as you might imagine. Still, the area along the Mekong is where the tourist hotels are clustered, plus most of the restaurants and bars. There are no tall buildings at all, and there are actually a few vacant lots remaining in the prime area, which contributes to the overall mellow feeling. Another surprise, and quite a good one, is that the city actually has sidewalks that are nearly 100% intact running through the main city center. This may not sound like a big deal if you haven’t spent much time in Southeast Asia, but seriously nearly all sidewalks in the region are either mostly-demolished, filled with motorbikes, or non-existent. Those who like to go for a stroll normally spend most of their time in the street at the edge of traffic, but somehow Vientiane is made for pedestrians. The local language is, of course, Laos (the S is silent again), and it’s quite similar to Thai so those countrymen can understand one another, but it’s also so obscure from an international standpoint that English is very common. The old rule that the fewer people worldwide who speak any given language adds up to a higher chance that those people also know English is in full effect here. Even in Thailand, many expats learn the language so many locals can do business with them in Thai, but in Laos it seems they have greater incentive to learn English, which they do in good numbers. There are a few shopping malls of one kind of another in Vientiane, and the ones that are similar to open-air markets do have some fairly aggressive merchants (at least when tourists walk by) but mostly this is a place where you can find just about anything you need in peace. It’s a rare combination in this part of the world, and quite a pleasant one. Overall the city is not quite as cheap as you might expect based on its remote location, but it’s still very cheap by international standards. Hotels start at around US$15 per night, and even at that level quality is pretty good. There are a few hostels and places with very basic rooms that are a bit cheaper, but paying more for a place with style seems worthwhile. Of course there are plenty of hotels with rooms starting at US$30 per night or even over US$100 per night, so those with higher budgets can get a lot of quality for a very appealing price. The food is mostly quite similar to Thai food, not surprisingly, but since Laos was run by the French for quite a while you also get some of their influences. You can actually get very good baguettes for next to nothing in Vientiane, while they aren’t available at all in most of Thailand. Finding a meal for around US$2 is quite possible, especially at some of the outdoor places clustered along the river. Something a bit fancy might be US$4 and up, but still a great deal. Fans of alcohol will be happy in Laos. Vientiane itself is home to the world’s cheapest liquor, known locally as Laolao. It’s a rice whisky and a whole .70-liter bottle sells for under US$1 in a shop. The most popular drink is Beerlao, which is one of the best in Southeast Asia, and a .65-liter bottle goes for just over US$1 at almost every restaurant in town. Interesting. Yet another country on my list of places to visit. Thanks for the information. “Sleepy” is the best word to describe the city. I would say that this was the reason why I stayed only one day in Vietiane. May be I was looking for something lively after some days at Don Det. Next time I will give it another chance for few more days..